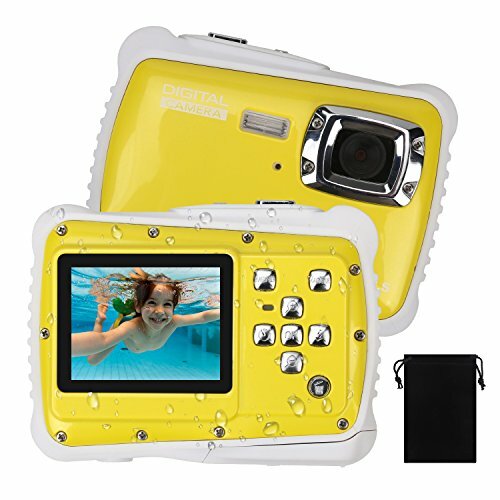 Waterproof Camera for Kids, DECOMEN Underwater Digital Camera for Children, Sport Action Camcorder with 12MP HD Photo Resolution, 2.0" LCD, 8X Digital Zoom, Flash, and Mic, Best Gift Choice for Kids. Please make sure battery cover has been stuck in the slot before using under water. This camera need 2*AA batteries and it support up to 32GBmicro SD card. 【Fantastic Gifts for Kids the best choice】: lovely design, easy to hold, waterproof, dustproof, anti-fall, to let kids enjoy the photo/video-taking in anywhere. 【12MP Photo & 720P Videos】:This childrens toy camera can shoot up to 12mp photos and 720p / 30fps video, to capture the baby's in motion most memorable moments of growth. 【2.0'' TFT LCD & 8xDigital Zoom】:With a 2.0-inch LCD screen, kids can immediately see what they're shooting and playing back. 8x digital zoom is good for seeing farther. 【Professional services】:We promise 1-year replacement and refund warranty with dedicated customer service and professional technical support. If you have any questions about this product by DECOMEN, contact us by completing and submitting the form below. If you are looking for a specif part number, please include it with your message.